I must say, in all honesty, when I was asked to review the new DVD/Blu-ray release: The Best Exotic Marigold Hotel, I wasn't too sure it was a movie I'd be interested in.Gerry and I love our action movies and I put up the wall before I gave it a chance.I thought for sure it was going to be BORING, but it wasn't- it was a GREAT movie and Gerry and I would both recommend it. There were parts that made us laugh and parts that made you feel for the characters and their own lives/stories. A heart touching story. 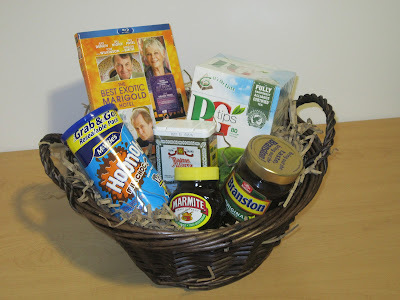 We got a basket of goodies along with the movie and it was really neat since alot of the items you see in the basket, were pictured in the movie as well.The basket contained products from both Britain and India- as the movie takes place with characters leaving their homes in Britain to come to live in India. Gerry and I found it alot of fun to have items that went with our movie- in theme..it really added to the whole experience! Spice Goddess, Chef Bal Arneson (Food Network and Cooking Channel Canada) checked out the movie and filmed her take on the movie along with her recipe for Butter Chicken…mmmm. If you don't run out and buy this movie at least be sure to rent it. I wanted to see “The Best Exotic Marigold Hotel,” when I first saw the commercials for it, but it was only in select theaters and did not play for very long. I’m an action junkie as well, but one of my co-workers at DISH saw this movie in theaters, and she really liked it. I’m glad to see it is on DVD; I would love the goodies basket, but will settle for renting this with my Blockbuster @home account. The shipping is fast, and since I have a long weekend coming up this will make for a great movie night with friends.